We can help you get your solutions to your markets. Faster. The world is full of advice for getting your website on the first page of Google in a just few days; how to buy success with followers and likes on social media; and how to maximize your traffic with advertisements on Google Adwords, LinkedIn, Facebook and Twitter. You just have to do it and the path to unprecedented wealth is paved. Yeah, right. Some time later, your bank account isn't what it was used to be and you haven't really hit the jackpot quite yet. Sound familiar? A saying in startup world is, "If it were easy, everyone could do it." That has held rather true for our own startups and businesses--we weren't born or founded smart. Pretty much all of the trailing thoughts and experiences, we have messed up royally in our own first steps. But we learned quickly (and the hard way) that this can actually work with a couple of simple principles. Let's turn this around and look at some basic premises that work for every startup, every business, and even individual situations. When pushing for quick results, build a foundation first. Yes, you can buy yourself to revenue. It comes at a cost, though. More often than not, that price is quite steep. "In the old days" (which were the days when we were young), one way to get traffic to your website was by placing pay-per-click ads, i.e., you paid $100s or $1,000s every month and you got Google Analytics show you, in real time, that you have this cool website with money laden visitors flocking all over your website. (At least) two things are wrong with that: only a small fraction of those visitors convert to buyers while the others remain anonymous visitors; and, more importantly, the second you stop paying for your PPC ads, that very moment your visitor stream stops. Unless you are real great at that approach (=born smart, some people are), learning in the paid advertisement world is VERY expensive and builds up little relative to a solid foundation for future growth. 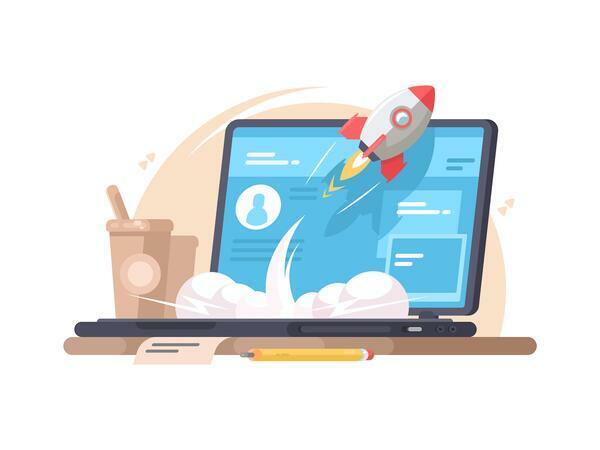 When boosting your traffic with paid advertisement, make sure to have a maximum amount of landing pages to help you convert into leads or customers. One of the ways to make that happen is through disciplined content generation. Content, often generated through blogs, lets search engines index your site and improve its ranking. When done right, it educates your visitors about typical issues your business solves for your customers, and inspires your prospects to reach out to you for potential solutions. Consultants and leaders called this "creating pull" decades ago, while the more modern terminology is "inbound marketing." Not only does good content generation answer questions your prospects might be searching for and, as such, attract them to your site, but it also provides a great opportunity to demonstrate competence in your areas of strength. Furthermore, visitor traffic coming from organic search, triggered by disciplined content generation, is compounding. Many of our customer examples show that only less than 20% of visitor traffic comes from content that was generated in the last 30 days. Does content marketing lead to quick results? Can you get the first prospect within a week of publishing your first blog post, having created your calls-to-action, and made white papers and guides available for download on dozens of landing pages? Well...... nope. Of course not. While content marketing often yields mind-boggling results and exponential growth, it can take a few weeks or even months for organic traffic to significantly pick up. Knowing how to write well and be able to reuse content for downloadable white papers, deep-domain-expertise pillar pages, email campaigns, sales-executive meeting follow-ups, etc. helps to accelerate the benefits you can obtain. Eventually the results will outweigh the initial investment by a long shot, and you will never look back. Get good at storytelling; network with storytellers; and build and convert a pipeline. When leads begin to come in and the interest in your brand, your products and your services begins to grow, you will need to sharpen your pitch to crisply articulate what value your customer can expect (and when) once they begin to use your products and services. What value are you adding? Why buy from you? Why now? Entertaining your visitors with the coolness of your offering is nice. You will need to articulate, though, (1) how you would use your services if you were the customer (and why) and ideally, (2) how others have already been using them and what results they've achieved. Expected or already achieved results, presented in a context relevant to your prospect and narrated in a familiar language, builds credibility. Having existing customers serve as a reference will further increase the trust and comfort level a new customer is looking for when making key decisions about your solutions. Being great in sales is being good at storytelling. Stories from the non-fiction section. Apply your story to incoming leads, coming from your networking, from your inbound marketing activities, from your referrals. At the same time, frame the sweet spot of your solution offering; define your target industries and buyer personas; and build targeted outreach campaigns to supplement your slowly ramping-up inbound marketing. Identify targeted names of people you'd like to win as customers. Listen to them, their requirements, their suggestions, their rejections. Modify your approach until you get it right. While "dialing for dollars" can be a frustrating exercise, working with a highly relevant target population will not only let you iron out the bugs in your product and go-to-market approach, but it will also generate wins. And let's face it, winning is better. Proactive digital advertising, e.g., adding paid advertisement on social media or Google Adwords is fine so long as you understand the temporary nature of those activities, i.e., they stop working the moment you stop funding them. If defined and targeted well, they can be a solid, cash flow-positive boost of your revenue stream, especially beneficial until your inbound marketing and brand reputation begins to kick in. Make sure to have sufficient landing pages to provide opportunities to convert traffic into leads. Finding the right outbound activities and combining them with your fundamental inbound marketing approach is a critical element of start-up success. The best venture capital comes from wicked happy customers. When you are employed in some large company, your paycheck comes from the HR department. When you are working with your startup, because you're not making any money, your pay comes from the venture capital company. True for many, still dead wrong. Ultimately, the thing that pays your bills will have to be revenue and that will have to come from customers. As simple as that. Bootstrapping at least your pilot phase, building and showcasing the foundation of your go-to-market success with modest means (e.g., inbound marketing, grooming your storytelling capabilities to build your pipeline, and winning first pilot users) will not only increase your chances of success, but also significantly increase your negotiation position when it comes to attracting external capital. Ask for advice, even if you don't need it (you might be surprised anyway). Yes, good advice can be expensive. If it is truly good, though, it will be more than just an expense. It will provide you with a tangible return on investment (ROI). An ROI of more traffic, more referrals, more opportunities to convert traffic into leads, and leads into customers. Network with individuals and companies who have lived through the whole cycle of building successful and growing companies, ones who have failed doing so but have succeeded more often. Learn to not just grow big with lots of money burned through in a flash, but how to grow better by building a foundation with lots of capabilities in your business and yourself. If benefit and ROI disappear when the consultant, the agency or the money stream stops, it will not have been the best approach for you to help you grow better. In addition to working with great partners (and paying for it, for a return), surround yourself with great mentors. Mentors who have nothing else in mind than seeing you succeed. Mentors who listen rather than talk, mentors who coach rather than instruct. Most great (business) leaders will cite their mentor network for their success. You can find great mentors in all aspects of life, in your city's startup community, in LinkedIn groups, (good) old bosses or teachers, etc. Be proactive in building and maintaining a small network of mentors. Even and especially when you think you don't need them. The world's best athletes surround themselves with the great trainers, even though they are at high performance already. It works for us as well. If we don't learn and improve ourselves, we won't be able to do the best for ourselves, our families, or our businesses. "We have a strategic plan. It's called doing things". It is good to dream, but, you need to get started. The longest journey starts with the first step. Success in business requires the first customer, the first sales opportunity, the first prospect, the initial lead, a first visitor. Building your business and your customer attraction model with the "end" in mind is important. But even more important than having a plan is to get started. All the best of luck with it. If you want to bounce off some ideas and plans, let us know.